Love the idea of bumps but not sure how to tackle them? Lose your nerve when you’re staring down a field of metre-high moguls? Relax, moguls are fun and once you understand how to approach them, they’re a skier’s dream! As long as you’ve got your basic skiing technique down pat, it’s not a big jump to learn how to ski moguls properly. Following are some tips to help you master the moguls and avoid those awkward falls! What are moguls and how do they come about? Who makes all these moguls, anyway? The answer is that moguls are a natural result of many skiers skiing a slope without it being pisted in the meantime. The more a piste is skied on, the higher the moguls will get. Some moguls can reach heights of several metres! Before piste bashers became a regular feature, moguls were a common sight on the mountains. Although there are less and less of them every year, they still inspire dread in novice skiers and fascination in more experienced skiers. Like when you’re carving, you should have your hips, knees and ankles slightly bent in a position that allows you to have a relaxed stance and a balanced centre of gravity. However, unlike in carving, you’ll need to keep your skis quite close together. You can practise this stance on a non-mogul slope by making short turns with your skis around imaginary bumps. When skiing moguls, the aim is to cushion the impact of your landing as much as possible. To this end, you’ll have to ensure that your centre of gravity doesn’t bob up and down too much. Your knees should work like shock absorbers, stretching out straight in the troughs and bending almost all the way on the bumps. Putting a little extra pressure on your skis every time you come out of a bump and into a trough will help control your speed. You'll find that if you do it right, the skis will virtually guide themselves over the moguls, giving you a little extra speed every time you initiate a turn. One of the tricks to properly skiing moguls is choosing your line. Ideally, the piste you’re on will allow you to choose a line that allows you to complete a turn with every bump, planting your poles on the bumps to get your body in the right position and following the natural fall line of the mountain. Staying on the track you’ve chosen requires stamina to keep initiating your turns – if you need a break, stop and recharge your batteries every few turns, or try using the back side of the moguls to help slow you down. Mogul skiing is one of the best tests for both your fitness level and your concentration. Now that you understand the basics of skiing moguls, you’ll want to practise your technique. Following are some fantastic mogul pistes where you can test what you’ve learned. Skiing moguls is strangely addicting and you’ll find yourself hankering after more bumpy slopes! But it can be hard to find them. Let us know your favourite mogul piste in the comments! Feldberg: This small German ski resort is home to an annual freestyle race on the mogul piste. Nebelhorn: This ski resort in the linked Oberstdorf ski area is one of the longest mogul pistes in Germany (700m). Höllspitzbahn: Part of the Ischgl - Samnaun - Silvretta Arena, the Höllspitzbahn has some great bumps when the snow is right. Gamsleiten 2: In the Obertauern ski area, you’ll find a piste with extreme moguls and a gradient of up to 100%. Swiss Wall: This legendary mogul slope in Les Portes du Soleil is among the most famous slopes in the Alps. Alpe d'Huez: This French ski area is home to Le Tunnel, a steep slope whose deep moguls challenge even the most experienced skiers. Try these techniques on smaller moguls before moving on to the really challenging slopes. Plan your line before you set off and increase your speed gradually instead of starting fast. 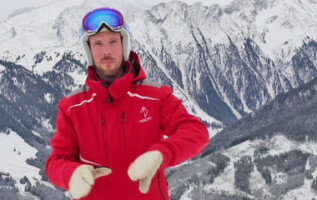 And remember, if you really want to improve your technique, there's no subsitute for a qualified ski or snowboard instructor.